Get in and out of your shoes in a snap. 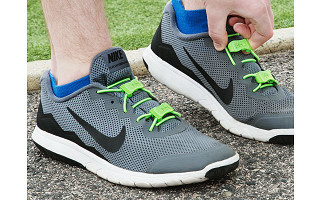 Shoelaces get replaced by these clip and loop closures that stay secure but give a little stretch. Made in the USA, they’re designed by a triathlete for other athletes—but they work just as well for anyone tired of tying laces. Each set of SnapLaces secures your sneaker snugly with tension you set yourself, acting like a tiny bungee cord. You can adjust them as needed to get a perfect fit. 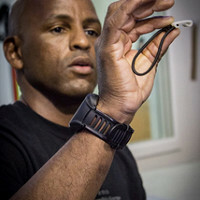 Changing shoes fast was key for Founder Reggie Senegal, who was looking to shave some time off his transitions during triathlons. He created a minimalist design that didn’t hamper his performance—and can even be done and undone with one hand. SnapLaces create a streamlined look that does away with floppy shoelaces, leaving no untied laces to trip you up. Now you can just snap and go. Hello everyone! I'm proud to introduce SnapLaces to The Grommet. I'd be happy to answer any questions you have! Will these work with a child's shoes? Yes they will! The laces are completely adjustable. My children have worn them as young as 3. How do you tighten them or adjust, just pull/release length of laces in closure? @Todd There are tiny wedges on the clip that allow the cord to slide through. 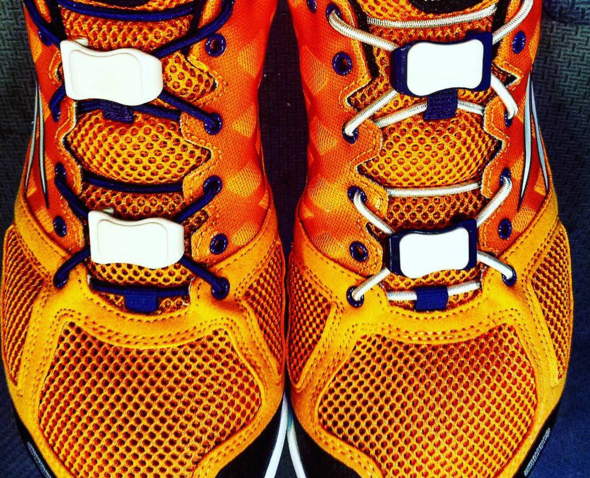 Once you adjust the tension to fit exactly the way you want, the clips allow you to quickly release the laces. Would these be suitable for the elderly with arthritic hands and a touch of confusion? 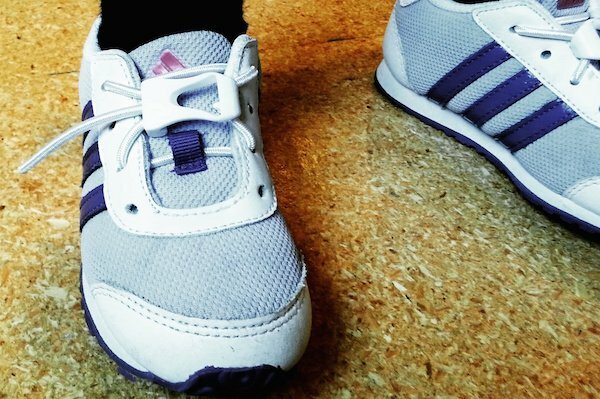 @Nancy Hi Nancy, they sure would :) SnapLaces were originally developed for athletes, but we've had groundswell of people who are now using them because the had difficulty with traditional laces. Test them with confidence, we have an epic warranty. Same question as Nancy. Arthritic hands? @Larry Hi Larry SnapLaces work great for a variety of hands :) We've been inspired by the stories people have shared with us about how SnapLaces have helped them. Neat - I need them in BLACK ! I just see sport green an d white. @Ron We have them in black! Click on the tile to buy them and you'll be able to select that color. Do these come undone easily? @Linda They are easy to unhook, but they do not come undone while you are using them. We have people using them in Spartan Races because they can quickly remove the mud and rocks from their shoes, but are stable and secure while they are traversing the obstacles. Here are some additional shots of SnapLaces. Note you can cut the excess in the second image for a sleeker look. These are great. However, I have watched the mini-video three times and the girls' hand is in the way after she threads the laceing into the second hole. I don't see where/how the clip is held in place on the left as looking at it from this side...Thank you. @Melanie great question. The clip attaches to the lace on the opposite side. If you look at the cover image for the video you can see the lace just below the clip. I have a very high instep which makes shoes difficult to fit, are these particularly long as laces go? @Donna Hi Donna, our standard length laces fit most shoes and needs, BUT if you find that longer laces are needed, just email us and we'll custom cut a set for you and send them out free of charge. So, it's not necessary to run the laces through all the holes in a pair of running sneakers???? @Alberto Hi Alberto, you are correct. With SnapLaces, you don't need to hit every eyelet. Because the tension is dynamic and perpendicular the laces hold without the need for all the holes. We spoke with a couple shoe designers early on and discovered that most shoes have all those eyelets because of laces!!! I only have one good hand. Think I might be able to use these? Also, will they work on regular leather dress shoes with 4 eyelets about an inch apart? How long should the laces last if closed and opened only once per day? These look great and just what I have been looking for with my hiking tennis shoes....are these washable? @Tom Hi Tom, yes they are. The laces are nylon and the clips are plastic. @Dew These should work great for you. We've had a bunch of people with a similar situation that were able to use SnapLaces. Looks like a good design, I'll try them out. But no one in your video does them up with only one hand. If you are selling them as one hand capable, you really ought to show that. @Edward the intro video Grommet created shows clipping and unclipping with one hand, it's pretty easy to clip in. I'd love to see a video of how to use. Thanks. I'd like to get some for my son's combat boots, but they don't come in a matching color. I don't think he would pass inspection in black, because his boots are tan. Can you please make them in tan? And how many sets would he need for 8" boots? Get in and out of your shoes in a snap. 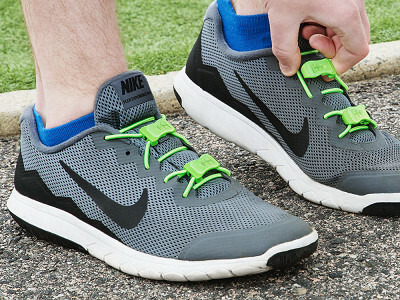 Shoelaces get replaced by these clip and loop closures that stay secure but give a little stretch. Made in the USA, they’re designed by a triathlete for other athletes—but they work just as well for anyone tired of tying laces. Each set of SnapLaces secures your sneaker snugly with tension you set yourself, acting like a tiny bungee cord. You can adjust them as needed to get a perfect fit. Changing shoes fast was key for Founder Reggie Senegal, who was looking to shave some time off his transitions during triathlons. He created a minimalist design that didn’t hamper his performance—and can even be done and undone with one hand.